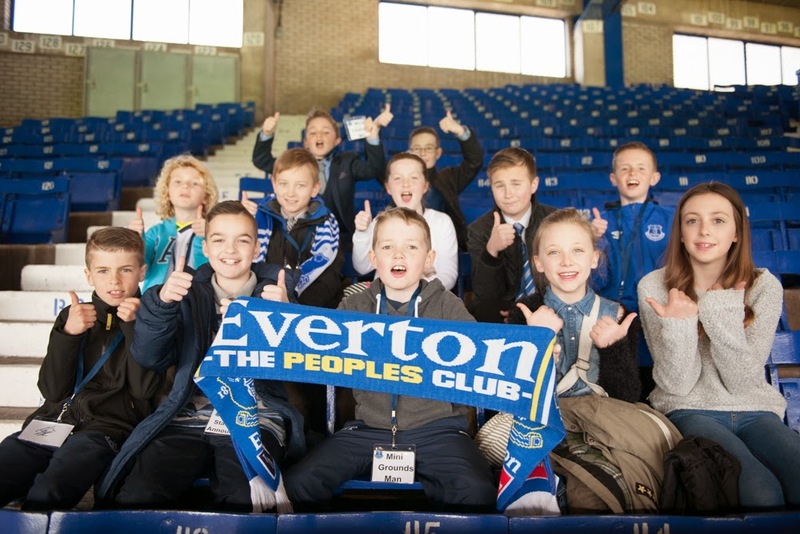 Goodison Park was taken over by an excited group of young Evertonians this past Saturday as the Blues celebrated Junior Fan Day. Fourteen junior Blues rolled up their sleeves and took on various roles to form the mini matchday team for the visit of Southampton. The youngsters got started early in the afternoon to make sure Goodison was ready for kick-off, with a trio of mini groundsmen – Nathan, Tommy and Finn - helping to ensure the pitch was in mint condition. Meanwhile, mini club photograph Isabelle was capturing the players’ arrival, and mini Sky Sports News reporter Joseph put his questions to John Stones in a special pre-match interview. In the corporate lounges, mini MCs Ronan and Luke entertained guests by reading out the team news and interviewing former player James Beattie, while mini stadium safety officer Abby kept an eye on proceedings from the matchday control room before taking to the pitch to shoot exclusive Junior Fan Day t-shirts into the crowd. As kick-off neared, George, who was a mini Duncan Ferguson for the day, helped to set up the warm-up with the man himself, and stayed on the pitch to put the players through their paces. And, from the comfort of the dugout, mini stadium announcer Ben shared the mic with Radio City’s Rossie to reveal the teams to a sold-out Goodison Park. Finally, at kick-off, mini evertontv commentator Sam took his seat next to Ian Snodin to keep listeners from around the world up-to-date on all the match action. And it seems that their participation helped steer the Blues on to a 1-0 win! The mini matchday team is part of the Club’s annual Junior Fan Day, and all the youngsters taking part applied for their roles by entering a competition on www.evertonfc.com. And, for those not taking up a role in the mini matchday team, there was plenty to keep them entertained before the game, with live performances from local bands in the Fan Zone, football freestylers, face painters, aqua zorbing, Match Attax tournaments and the EA Sports dugout. In addition, hundreds of souvenirs were handed out in the form of player masks, poster books and blue noses, as well as free Easter cupcakes and ice creams. Junior Season Tickets for 2015/16 have been frozen at £95 for Under-11s and £149 for Under-16s. For more information, including how to buy and key dates, visit www.evertonfc.com/chosen.